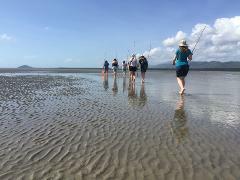 Locally owned and operated Adventure North Australia operates the unique and exclusive Daintree Dreaming tour, a small group tour which starts with a coastal walk with Kuku Yalanji Habitat tours. With the traditional owners of the land, guests are immersed into their culture, their beliefs and their home.On the second part of this tour there is a Welcome to Country smoking ceremony at Mossman Gorge as well as a guided interpretative walk and the opportunity to swim in this stunning part of Tropical North Queensland. Lunch is included on the tour. You will be collected from your accommodation and travel along the scenic costal drive north. Just past Port Douglas is beautiful Cooya Beach (Kuyu Kuyu). This special place is a traditional fishing ground of the Kuku Yalanji people. Join one of the Kubirri Warra brothers, Linc or Brandon on their beach, mudflat and mangrove cultural walk. This unique coastal place has three diverse ecosystems of beach, mangrove and coastal reef – that are connected to each other by the ever-changing mudflats and tidal lagoons. Here, you will be introduced to traditional fishing and gathering techniques with the aim of finding your own tucker (food). Your catch may include crabs, mussels and fish which are cooked up for everyone to share with homemade damper on the balcony of the family home. A short drive into Mossman Gorge where you will greeted with a traditional smoking ceremony. This ceremony is conducted by Aboriginal people with specialised cultural knowledge to welcome people to their land. It is a ceremony of spiritual cleansing, to ward of evil spirits and to ensure that while you are on the traditional land of Kuku Yalanji people you are accepted and honoured. Wander into the lush rainforest of the World Heritage Listed Daintree National Park – Mossman Gorge. Home of the Kuku Yalanji people. Experience one of the world’s oldest and most beautiful rainforests’ with your Adventure North guide. An easy walk across boardwalks, tracks and bridges that protect the delicate ecosystem that adorns spectacular waterfalls and mountain ranges. your guide will explain the rich flora, fauna and diverse ecosystem of this amazing rainforest. Ensure you bring your swimmers so you are able to make the most of the crystal clear waters of the beautiful swimming hole that is encased by rainforest. 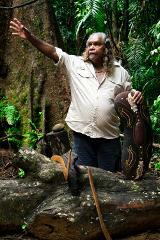 At Mossman Gorge are the Ngadiku Dreamtime Walks, conducted by the local Aboriginal guides. You can join join this optional 1.5 hour tour. Ngadiku (Nar-di-gul) means stories and legends from a long time ago in local Kuku Yalanji language. You are welcomed with a traditional ‘smoking’ ceremony that cleanses and wards off bad spirits. The walk then meanders through stunning rainforest and takes in traditional huts or humpies. Your experienced interpretive Indigenous guide demonstrates traditional plant use, identify bush food sources and provide an enchanting narrative of the rainforest and their special relationship with this unique tropical environment. Your guide demonstrates traditions like making bush soaps and ochre painting. At the end of the tour enjoy traditional bush tea and damper. A day to remember This fun, exclusive day tour allows you to join a real Aboriginal cultural experience combined with the pristine natural beauty of the World Heritage Listed Daintree National Park Adventure North Australia is a leader in Aboriignal tourism in Tropical North Queensland. Locally owned and operated. Wanhthaal-bi ngayu nganjin yununku miyil janay- We look forward to seeing you. *Please note tour can operate in reverse depending on tide times. **What to bring: Hat, sunscreen, insect repellant, swimmers, towel and bottle of water. Guests and guide (Bridget Lawton) having fun on the Daintree Dreaming Day Tour. A spectacular cultural journey taking you from coast to rainforest experiencing natural beauty and ancient culture. This fun exclusive day tour allows you to join a real Aboriginal cultural experience. Learn Traditional Aboriginal fishing and gathering techniques at Cooya Beach with Kuku Yalanji Cultural Habitat Tours. Visit Mossman Gorge Cultural Centre - World Heritage Listed Daintree National Park. Want to experience a tour with a difference and experience our regions Aboriginal Culture.? Come and spend the day with us and experience the land through the eyes of the tradtional owners, The Kuku Yalanji people. Fantastic day in Daintree forest and exploring beaches searching crabs and shells, hearing the stories told by the aboriginal people. Compliments to our guide, Bridget who could answer to all our questions, very prepared, patient, very nice person who made our trip very pleasant! Visit the beautiful Mossman Gorge on our Daintree Dreaming Aboiriginal cultural tour. Adventure North Australia would like to announce that effective immediately our Daintree Dreaming tour will no longer be going to Silky Oaks for lunch. Instead, we are now excited to be taking our guests to the all-new Mossman Gorge Centre. We went out there recently to try their lunch for ourselves and were very impressed. Not only is the centre in a beautiful setting but the lunch was absolutely delicious. All the ingredients were freshly prepared and there was plenty of local produce on the menu that was infused with some really beautiful rainforest flavours. We are sure that our guests will really appreciate this change in our itinerary. Another change is that we will no longer be going to the Niau Waterfall. With the wet season on our doorstep the Niau Waterfall can be very difficult to access. We have often used Mossman Gorge in the past when we have not been able to go the Niau Waterfall, however after an exhilarating swim in the waters of Mossman Gorge we have decided to make this a permanent fixture of our itinerary. Mossman Gorge has always been a very special and stunning place to go. With the addition of the centre and all the good work that is being done there we feel that our 2 products fit together nicely. When people choose to do our Daintree Dreaming tour they choose it not only for the destinations we visit but also for the opportunity to learn more of our indigenous culture. Mossman Gorge Centre is now an extension of that. An exciting day for our Daintree Dreaming customers today with the commencement of a new tour guide Cris Wilesmith. A young enthusiastic Aboriginal guide who has completed stage one of his training, Cris will be complete his training in 6 weeks and will guide the tours each Monday, Wednesday and Fridays. My Daintree Dreaming Day Tour was absolutely fantastic, I enjoyed every moment with Bridget, Tom, Brandon, our guides in the forest and on Cooya Beach. It was a wonderful, enriching, amazing day. Thank you! The Daintree Dreaming tour is the best tour I have ever done. The Cooktown tour comes a close second. The knowledge of the guides, especially Bridget, is simply astounding. It genuinely feels authentic and natural and like you've had a very personalised experience. If you can only do one tour while you are in Cairns or Port Douglas, then you must do the Daintree Dreaming tour. Unforgettable.